I equate Easter with sweets, being eight years old and frantically, breathlessly rifling through the house and around the backyard to find chocolate eggs, marshmallow bunnies, speckled jelly beans, malted milk eggs! Hence this fluffy felted bunny, complete with secret compartment to hide your high-fructose treasures once you’ve uncovered them. This bunny is adorable both felted and unfelted. And of course the secret compartment is optional. 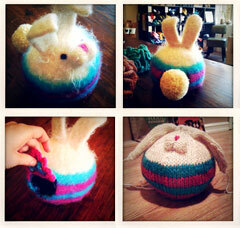 You could always just keep him as a friendly bunny ball, or decorative round bunny pillow. Help. When I try to download the pattern, I get a message saying it can’t be found. Is there another way to download it? Here it is April 1 and I got the same message? I would love to knit this up for my 2 yr old Great Nephew, HELP! Please, Please!! !